The Spigot is an aluminium clamp and spigot system designed to be permanently fitted to new or existing substation busbars. It accommodates up to five P&B Weir Electrical line end clamps suitable for 38mm diameter busbars, reducing the need to use the heavier 115mm to 250mm range of clamps. 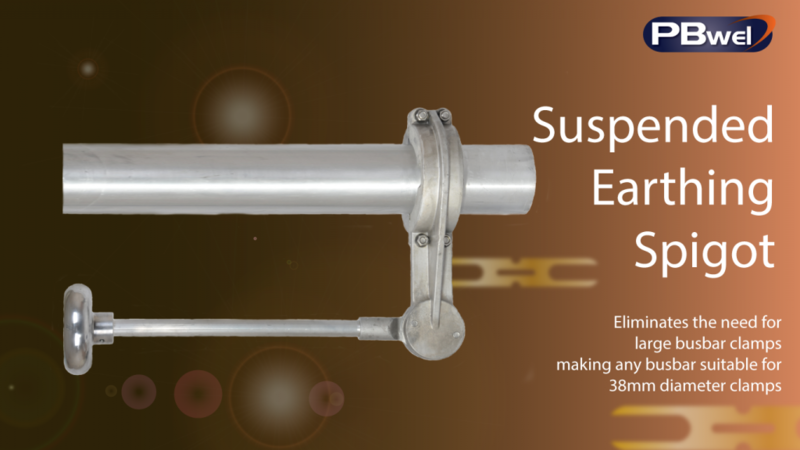 The Suspended Earthing Spigot is designed to be installed easily, either during the initial erection of a new substation busbar system or subsequently, as an enhancement to an existing system. It comprises a range of three clamps machined to fit any of the busbar sizes currently used in substations throughout the UK, from 115mm to 250mm diameter. The appropriately machined clamp is supplied in two halves that are bolted together around the busbar using the supplied fasteners that are tightened to prescribed torque settings. Its light weight makes it possible for one person to install. A 38mm diameter spigot and corona shield, common to all spigot clamps and busbar sizes, is then bolted onto the clamp. This is positioned horizontally to cater for busbars at any angle from horizontal to 60°, before tightening to a prescribed torque setting. 1kN mechanical loading trials, Continuous current test at 900Amps RIV and corona discharge tests, Short circuit current test at 80kA for 1 second including a peak at 200kA, Short circuit current test at 40kA for 3 seconds including a peak at 1OOkA.